As “The Engagement Party” begins, we see a happy, wealthy couple preparing to celebrate with their oldest and dearest, and hoping to make memories that will last a lifetime. In their multi-million-dollar Park Avenue apartment, Alison (Beth Riesgraf) and Josh (Zach Appelman) set out their finest crystal before the arrival of Alison’s rich parents and a few of their not so fortunate, hard-working college and childhood friends. They have prepared a delicious meal and bought lots of wine, and happily receive congratulations and gifts from all. The happiest of times or a setup for disaster? As one actor described it in the post-play talkback, Samuel Baum’s “The Engagement Party” starts as a comedy, turns into a mystery and ends as a drama, an apt description for Baum’s witty writing and plot evolution. No spoilers here: but audience members cannot hold back their surprise, audibly gasping as the play unfolds in the kitchen, dining room, and bedroom upstairs. Secrets from even the distant past can surface and impart a growing mistrust – its tentacles far-reaching enough to eventually “engage” not only the couple but also their family and their friends. The ensemble of actors works seamlessly together. Appelman and Riesgraf create the “happy couple” and are supported beautifully by the rest of the cast. Brian Patrick Murphy’s dialect as Johnny is an achievement in not going overboard (his real speech was revealed in the talkback! ), and Brian Lee Huynh as Kai contributes just the right amount of negative disaffection. 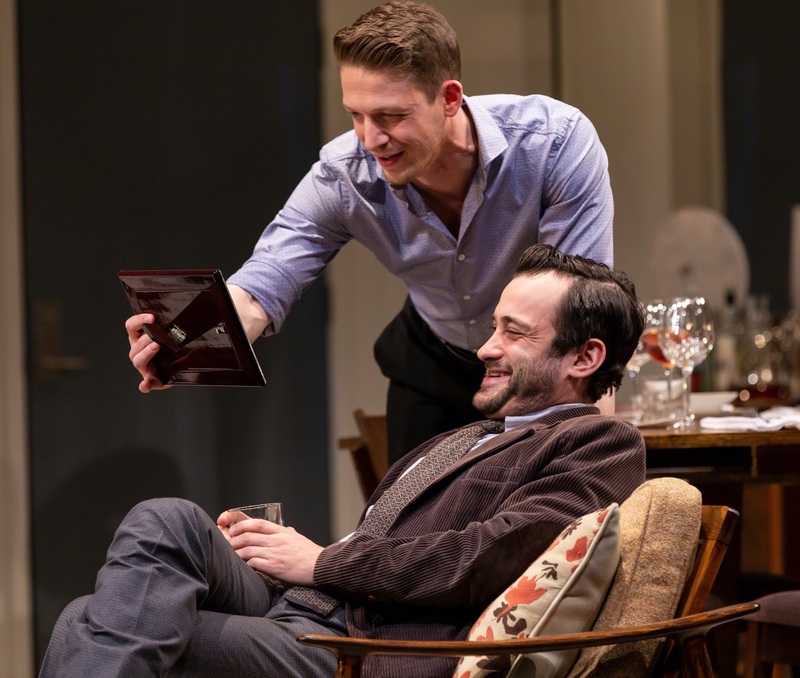 The unfolding plot of “The Engagement Party” postpones the creation of empathy for the characters; the play asks its audience to be absorbed in their back-stories before we become sympathetic to their angst. We observe the characters with detachment for a while, before we begin to share their feelings. The witty pre-dinner chatter brings laughter, the growing suspense brings wonder, and the unfolding drama finally allows us empathy and understanding. The enigmatic ending might lead some playgoers to want a sequel. And many may also discuss the intertwined roles of trust and of lies – great lies, white lies, and lies of omission – on the drive home. May Samuel Baum continue to write on the theme of deception and bring more theatre experiences like this one to the stage. “The Engagement Party” is a total success.